Hummingbirds aren't just beautiful birds--they're also pollinators! Inviting them to your garden with nectar and a feeder made specifically for hummingbirds will benefit them as well as your garden. 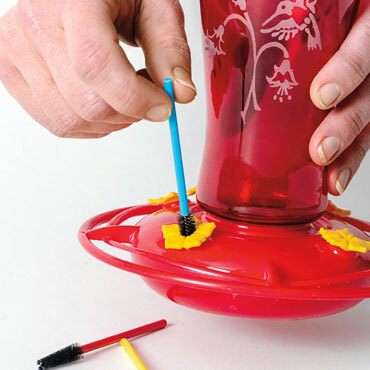 These Hummingbird Feeder Brushes are meant to be used with our High-Perch Hummingbird Feeder or The Perfect Hummingbird Feeder, both of which feature narrow passages for the hummingbirds to drink the nectar. The brushes will help clean those hard-to-reach passages, easily sweeping anyway any dirt or built-up nectar. When you're done, use your feeder as usual, and the hummingbirds will come flocking back. Clean out your hummingbird feeders about once a month to keep hummingbirds healthy and happy.